Abu Shadi Jradi pulled bodies out of wreckage for hours - two toddler girls wearing tiny gold earrings, a small boy whose pale blue pacifier still hung from his neck. Somewhere in the middle, Jradi slumped beneath a tree and wept. 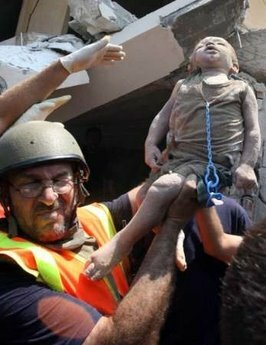 After hours of digging in the blistering heat, Salam Daher emerged from the wreckage with the body of a 9-month-old baby, a blue pacifier still pinned to its nightshirt. However, this is one of the most-photographed events in modern times. there are possibly thousands of still photographs and hours of video footage, much of which output has been placed on the net. 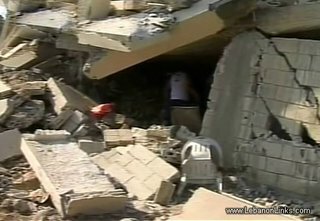 In this footage, we see plenty of digging, mostly by people dressed in Lebanese Army uniforms, aided occasionally by men in civilian dress. We also see footage of Red Cross workers clearing away debris in order to move bodies from the scene. Intriguingly, in what looks like the early stages of the "rescue", we even see this bizarre scene. A man in a pale green shirt (described in other footage as a "local resident") is sitting inside the wrecked building, actually on the mound of rubble under which people are buried, conducting a prolonged conversation on his cell phone. We see quite a lot of this man in other scenes but his demeanour in this photograph is somewhat at odds with the another legend built round the event, that the building was in danger of imminent collapse. The one thing we do not see in any footage though - including the extensive coverage of the scene inside the wrecked building - is "Green Helmet" doing any digging. We see him everywhere on the site. 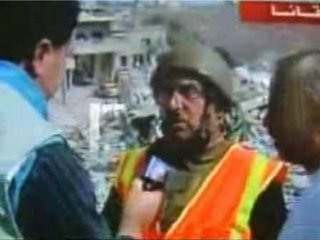 In addition to his starring roles, and finding time to slump beneath a tree and weep (curiously unrecorded on film on a site that was saturated with photographers and video cameramen) he is filmed giving interviews to the media (as in above left), inspecting the bomb crater and even helping carrying stretchers. We also see him in this cameo role (above right), dragging out in some haste the body of what is believed to be a ten-year-old boy, apparently illustrating the urgency of the casualty evacuation in view of the impending collapse of the building. What we see of this scene, recorded on video footage, is that "Green Helmet" enters the wreckage specifically to take part in the removal of the body. Up until then, he has not been involved in its recovery. It would not be untoward to suggest that the man is in fact posing for the cameras, the frame on the right recording him giving yet another television interview. On the basis of the photographic evidence, it would be very hard to define "Green Helmet's" role in terms other than of a "front man", functioning essentially as media liaison and the "face" of the rescue effort, posing for all manner of operations. And it is here, in Scene 1 that we see egregious examples of the man posing. The first photograph, taken by Ali Haider for epa/Corbis, clearly demonstrates this. There are all sorts of odd things about the scene, not least the uniform consistency of the dust in which the body is now half-buried, but what can also be surmised without hesitation is that it is obviously staged. Look at how the soldier-figure is holding the head up to the camera and how the other figures are lined up against the wall, with "Green Helmet" as the central figure. Then there is this one (right). 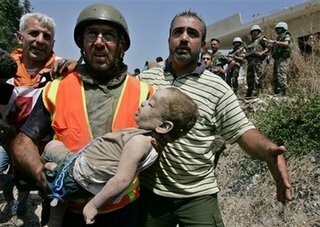 It is shot by Reuters' Adnan Hajj, the man who subsequently was found out doctoring photographs of the Beirut bombing and the F-16. Apart from the fact that the lighting is a lot less even and there is more shadow in this shot, what is evident here is that the baby's body has been excavated more completely, or "Green Helmet" has pulled it from the dust. Certainly, there is more of the body visible than in the previous frame. 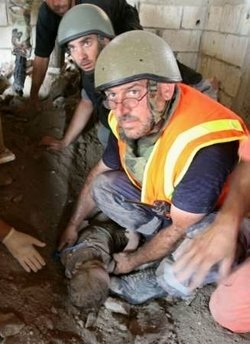 Of special note, though, is that of the two faces visible in the shot, both are looking up to the camera rather than down at the body which they are pulling from the debris. This is clearly and unmistakably posed. Furthermore, in the foreground, the hand of the Red Cross worker is seen to be blurred, indicating movement. The hand to the left, belonging to the soldier-figure seen in the previous frame - is sharp, without blurring. It is being held still - again suggestive of posing. Now look at "Green Helmet's" left foot. It has moved from the position shown in the previous frame, from about a foot away from the body's head to right next to it. The two shots are separate - not the same scene - taken at different times by different photographers. This apart, both the poses and the circumstances of the discovery of the body seem contrived. This has given rise to suspicions that the body might have been discovered earlier and held back for a staged event in order to maximise the publicity impact of the discovery. We have explored this issue in Appendix 2. If we can call the previous sequence "Scene 1", the next scene starts as "Green Helmet" emerges from the wreckage carrying the body of the baby. 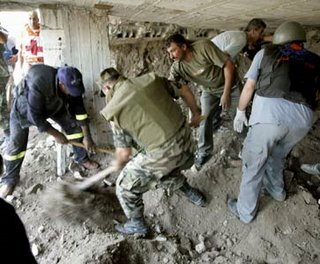 We have numerous shots of this "set" (see left), with many views of rescue workers either clearing up debris or carrying out bodies. Logically, this being the entrance and exit to the disaster scene, it needs to be kept clear, and by and large it is. But not, it seems, when Green Helmet emerges with the body of the dead baby. In this shot, credited to AP's Kevin Frayer, we see a group of nine people outside, all gathered around "Green Helmet". All of those with their faces visible are looking up to the camera in a composition that can only be contrived. And far from "Green Helmet" merely "displaying" the body, as Gannon puts it, he holds it up triumphantly, like a trophy. And where is Frayer? As can be seen from subsequent shot, his is taken from an elevated position. He has climbed up onto some vantage point to get his picture - hardly an example of a spontaneous shot. 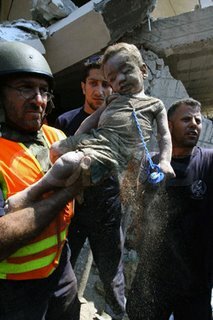 The next shot is by Reuters' Adnan Hajj. He has already taken a shot of the body being unearthed in the wrecked building but he has time to come out and position himself ready to take another shot of "Green Helmet" as he poses with the body outside the wreckage. And this is posing. In Frayer's shot, "Green Helmet" is looking up and towards the camera. In this shot, with the camera position lower and to the left, "Green Helmet" is still looking towards the camera. Clearly, these are not simultaneous shots taken from different vantage points. They are posed separately, the two photographers each being given their own unique shots. Even with these two photographs, however, the "shoot" is not over. In the previous two shots, the head of the baby's body is tilted backwards, most noticeably in the second of the two shots. For this picture, though - original source and attribution unknown - the deficiency is remedied. It appears that one of the men in a dark blue tee-shirt has moved behind the corpse and is tilting the head forwards with his hand to give the photographer a better shot. And here we have another of the "dead baby" shots, this one taken by the AFP photographer. Again, "Green Helmet" is facing the camera, presenting the photographer with a clean shot. In this frame the body's head is lolling but, what is remarkable is that you can see at the bottom of the frame, dust actually being shaken off the body. 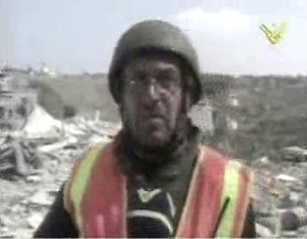 That the body was shaken violently is confirmed by a short clip of video (published here), which shows "Green Helmet" virtually throwing it into the air, a gesture which accords with some witnesses' accounts of it being a gesture of "defiance and despair". The same effect is seen here, in a photograph taken by Nabil Ismail for Xinhua Press/Corbis. These last two frames were probably the first of the sequence of shots. Whatever, this makes at least four and possibly five (if not more) still cameras shooting the scene, plus at least one videocam. And, as a final note on this issue, prominent in the photographs is the blue "pacifier" (we call it a "dummy" in the UK). There has been much speculation on the apparent cleanliness of this item, with suggestions that it might have been "planted". However, in the original shot where the body is unearthed it can be seen attached to the body. As to its apparent cleanliness, we are dealing here with low-definition photographs and it would be unwise to rely on them for the finer points of detail. What might not be visible on these photographs might be very obvious on the high definition copies which - so far, the agencies have not released. Further speculation, therefore, is a route down which we do not want to go. In her eulogy for "Green Helmet" - to which we refer in the introduction and will deal with more fully later - Kathy Gannon wants us to believe that an AP photographer just went "click" with his camera, taking just one, opportunist shot as "Green Helmet" momentarily lifted the baby to show to the waiting media. That, we can see, was not true but, if there is any doubt as to the lack of spontaneity, this - Scene 3 - also seems to be highly contrived. Furthermore, it is an AP exclusive comprising three photographs in all, taken by Kevin Frayer. This one on the left - from the positioning - seems to be the first of the sequence, played out (as we illustrate in Part 2) round the corner from the opening to the wrecked basement, in front of the house. Judging from the angle relative to the window of the house, "Green Helmet" is in roughly the same position as the Red Cross worker in the picture above. 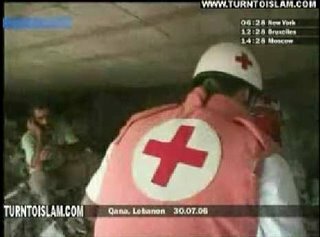 He is in the company of a sizeable group of people and facing what appears to be (from other footage) a senior Red Cross worker. Crucially, from the photograph above, we know the direction of travel and "Green Helmet's" body is not facing that way. That, with the rather fortuitous composition, suggests that the shot is contrived, with "Green Helmet" once more posing for the camera. Now, as an additional detail, look between the heads of "Green Helmet" and "Striped Tee-shirt". You will see a sliver of very distinctive blue - it looks like part of a UN soldier wearing a flak jacket. This frame, again judging from the angle to the window, seems to be the next in the sequence. The party has moved on, senior Red Cross Worker is no longer visible and the man with a striped tee-shirt is displaying what appears to be some emotion. 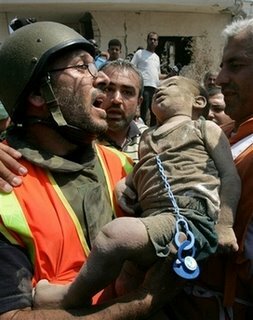 Once again, "Green Helmet" is facing away from the direction of travel and looking directly towards the camera, holding the body of the baby aloft. The indications are, therefore, that this again is a posed shot. Recalling the sliver of blue in the previous frame, this can no longer be seen - perhaps concealed by the group in the foreground. But we see the same blue on the uniform of the soldier on the veranda. He is, however, in a completely different position - in front of the window opening - facing away from the camera. Now we come to what looks to be the final frame of this sequence. 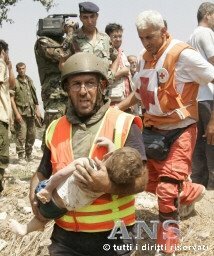 "Green Helmet" has moved on, the man in the striped tee-shirt remains by his side and senior Red Cross worker has re-appeared on the opposite side. But revealed now is a line of UN troops up on the veranda of the wrecked house. In roughly the same position as the soldier in the previous frame with a bright blue flak jacket is one of the UN soldiers with a green uniform. "Bright blue" is nowhere to be seen. The indications from this and other background changes (look at the relative positions of the man in the white tee-shirt in the first two pictures of the sequence) it does not seem as if "Green Helmet" and his various companions are walking continuously down the lane. More likely, it appears, they are moving progressively to slightly different locations and stopping to be photographed each time. These three photographs, though, conclude the Frayer sequence and, effectively, Scene 3. But what are we to make of this picture, on the left. 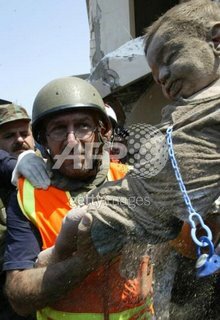 Published by the Italian press agency Ansa, it is actually taken by Ali Haider for epa/Corbis. 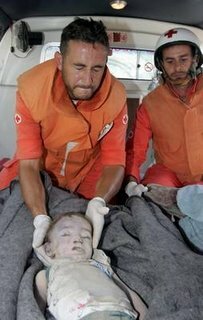 It shows "Green Helmet" with the baby but with a completely different cast of characters, bar the familiar, white-haired Red Cross worker. He is stepping down what appears to be a low ridge of earth. The background is unrecognisable, but it does not match any of the other scenes. We already have three separate sequences, in three different locations, in which "Green Helmet" poses with the baby. Now it looks as though there was a fourth. How "spontaneous" is that, and how many more sequences were shot? Actually, there were three more that we know about. This one is taken - we think - somewhere between the wrecked house and the staging area. 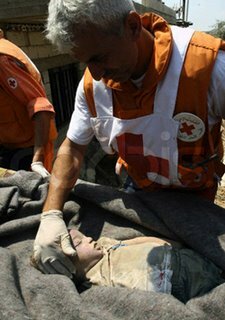 In sharp contrast to the "camera run" scenes, where the bodies of two girls each are carried respectively by "Green Helmet" and "White Tee-shirt", the body of baby Abbas Hashem is afforded a stretcher with two bearers, and is covered by a blanket. But, once more, a Red Cross worker cannot resist the opportunity for a pose, peeling back the blanket to allow the shot to be taken. Th man shown seems to be in charge of the Red Cross detachment, and he has already inspected the body while it was in the arms of "Green Helmet" (seen in Scene 3). This is in the back of an ambulance, presumably at the top of "Stretcher Alley". 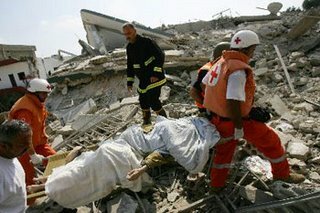 We see two Red Cross workers in again what is clearly a contrived pose. One is holding the head of the baby to the camera. Whatever else, this cannot have been a spontaneous shot. From the angle, the photographer seems to be inside the ambulance - partially at least - what is effectively private and certainly controllable space. Had the workers wished to exclude photography, they could have done so. Instead, they posed for yet another shot, and the "snapper" willingly took it. Even then, they have not finished. In some news reports, there is a mention of there being so many bodies that a refrigerated meat delivery vehicle had to be pressed into service (despite the large number of ambulances that attended the scene). 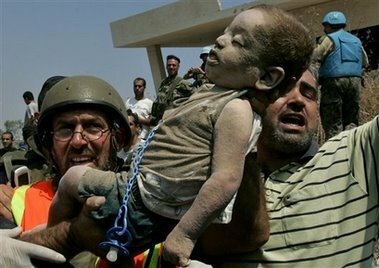 And, to illustrate the point, the body of Abbas Ahmad Hashem is once again recruited for a pose to the camera. And once again, an obliging Red Cross worker is the foil, against which the grotesque display is mounted. 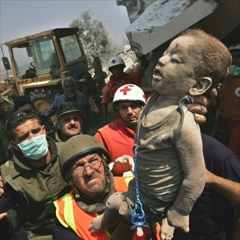 Through its progress from the wreckage to the ambulance, therefore, the baby's body is exposed to seven identifiable photography sessions. This, even allowing for what some claim to be the different cultural values of the Middle East, is not normal. Was it the EU's fault? You thought it was over? What can you expect with those A-level results? What will France do next? Part 2 - The "set"
Part 7 - Act 4: Caught in the act! What will they do if they return? Who is to run our foreign policy? It's all the same war!